Truck Accident Personal Injury & Wrongful Death Lawyers in Indio, Riverside, California Do You Need Assistance of Experienced Accident Injury Lawyers and Law Firm For Your Truck Accident Personal Injury Claim or Wrongful Death Accident Claim? Trucks are frequently referred to as commercial vehicles or commercial trucks. These are much bigger and heavier than regular trucks and smaller passenger cars. Majority of time, moving trucks carry heavy and sometimes dangerous loads, which are flammable or hazardous. 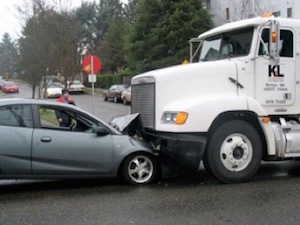 Therefore, accidents involving trucks are often much worse than smaller car collisions. This is due to their massive size, weight and resulting momentum. An Indio truck accident is not only catastrophic, but may cause permanent physical and emotional injury, and can sometimes even be fatal. So, if you have a truck accident or other personal injury claim in Indio, Riverside County or anywhere else in California, or if you are the relative of a victim with a wrongful death accident injury claim, please contact our truck accident personal injury lawyers and legal team now. We are an experienced team of truck accident personal injury lawyers for Indio with over 40 years experience that will aggressively pursue your rights and obtain maximum compensation for your physical injuries, as well as for your emotional turmoil and financial losses. To learn more about the truck accident injury claims process, please visit our Truck Injury Accident Web Site. More information on our lawyers’ background and experience of handling truck accident personal injury claims and wrongful death claims in Indio, Riverside and anywhere else in California, browse through our lawyer profiles and our personal injury & wrongful death case testimonial pages. A small city in Riverside County, California, Indio is located approximately 23 miles east of Palm Springs. Named after the Spanish word, Indio, which means Indian, the city is located in the Coachella Valley of Southern California's Colorado Desert region, known for the Coachella Music Festivals. According to the 2010 U.S. Census, the total population was 76,036. Indio is the birthplace of many noted personalities, including actor Vanessa Marcil, writer and director Cameron Crowe, and professional boxer Timothy Bradley, Jr. If you had a truck or car accident or need assistance with any other personal injury claim or wrongful death accident claim in Indio, Riverside County, California, please contact us now for a completely FREE CONSULTATION. Moreover, for further information on truck accident injury and legal advice, log on to our free advice website. Want a FREE case evaluation and more specific information? Just call us at 1-866-INJURY 2 or 818-222-3400 (after hours, press 1) or click here for a personal, no obligation and absolutely FREE case evaluation & FREE consultation. Call Now: No Fee Until You Win! Do not hesitate to call us at 1-866-INJURY 2 or 866-465-8792 or 818-222-3400 (after hours, press 1) for a FREE, no-obligation consultation & case evaluation. And, if you prefer, you can fill out our simple contact us form, to learn about your options. Call Us Now For A FREE Case Evaluation! You will be glad that you did! We work on contingency fees on personal injury & wrongful death accident claims which means: NO fees until you WIN!